Pre owned item, good condition has been cleaned. Ending Today at 8:50PM PDT6h 41mMetal: Sterling SilverStyle: ChainLength: 20 - 21.99"
David Yurman Small Cross. Condition is Pre-owned. No cleaning cloth or bag included. DAVID YURMAN LARGE CHEVRON CROSS. DAVID YURMAN CHAIN 2.7mm/22”. DAVID YURMAN POUCH BAG INCLUDED. David Yurman Sterling Silver "Petite X Cross" Necklace. Condition is Pre-owned. Shipped with USPS First Class Package. David Yurman Sterling Silver 925 Cable Cross Pendant. Condition is Pre-owned. Shipped with USPS First Class Package. Chevron Cross Sterling Silver Pendant. NEW AUTHENTIC. New and authentic. DAVID YURMAN 18K GOLD & STERLING CROSS PENDANT WITH 20" BOX CHAIN NECKLACE in great condition! This necklace is unisex! The chain has the dy logo. Cross measures approx. 1.25 long and 3/4” wide. It’s marked DY 750 & 925 on the back of the cross. chain is 20” long Great necklace for a great price! DAVID YURMAN GOLD AND SILVER CRUCIFIX CROSS LARGE PENDANT !!!!!!!!!!!!!!!!! THIS LOT IS A PRE-OWNED DAVID YURMAN GOLD & SILVER CRUCIFIX PENDANT IN VERY GOOD CONDITION. SEEE PHOTOS FOR DETAILS. CONTINENTAL US ONLY. GOOD LUCK! Authentic David Yurman. Great condition.very little wear. 50mm from bale to bottom of cross and 29mm in width. David Yurman 28mm Anvil Cross Enhancer Silver/Bronze. Enhancer is 28mm long by 21mm wide, including the bail it's about 38mm long. David Yurman Modern Chevron Cross Necklace. Sterling Silver Necklace and Pendant. This is a DISCONTINUED item from David Yurman. Stamped D. Yurman 585 926. His intriguing piece of jewelry is crafted in a gorgeous Sterling Silver/Forged carbon construction and features a beautifully designed cross/crucifix pendant design. This piece has a built in approx. DAVID YURMAN .925 Silver Frontier Cross, NEW PRICE $325. 1 1/2" high.925 Silver, Genuine David Yurman. Normal wear condition. Cross is 50mm tall and 30mm wide. Bale attached. Chain Not included . DAVID YURMAN IRONWOOD CROSS PENDANT. DAVID YURMAN CHAIN BOX 2.7mm WIDE AND 22" LENGTH. CROSS 50mm X 26mm. Cross: 1-1/2in ( with the loop). DAVID YURMAN LARGE SKY CROSS. DAVID YURMAN CHAIN 2.7mm/22”. DAVID YURMAN POUCH BAG INCLUDED. 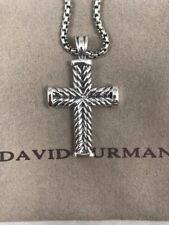 100 % Authentic David Yurman LARGE CROSS PENDANT. Stamped D.Y.585.925. 14/k gold and sterling silver. With this specific piece it has been fused with the Sterling Silver David Yurman is widely known for. 24mm | (.9") Which is the Smaller Size. Forged Carbon inlay on the exterior. Sterling Silver Cross Pendant. 18K YELLOW GOLD DAVID YURMAN CABLE CROSS WITH 14 IN BOX CHAIN Cross measurements are 15mm with bale 12mm without bale 9.5mm wide. This is the perfect elegant piece for everyday. 100% authentic Please check out my other listings! David Yurman Sterling Silver Armory Cross W/ Box Chain 20"
David Yurman Sterling Silver Armory Cross W/ Box Chain 20". Condition is Pre-owned. Shipped with USPS First Class Package. Forged Carbon inlay on the exterior. 18K Yellow Gold Cross Pendant. Pendant Only (they were never sold with the chain included). Beautiful David Yurman cross pendant. Could use a professional cleaning once received to really make the sterling silver pop. Pendant is in great condition. David Yurman Reversible Cross Onyx, Box Chain Sterling Silver Necklace 24"
NEVADA SILK INLAY # 29P. DAVID YURMAN. STERLING SILVER FRONTIER CROSS. MADE OF. 925 STERLING SILVER. ORIGINAL BOX, POUCH & POLISHING CLOTH. WE ARE HERE FOR YOU! David Yurman Large Thoroughbred Cross Pendant. This is aUNISEXAUTHENTIC David Yurman 18k yellow gold & sterling silver Cable Classics Cross Necklace with Yurman's signature cabledesign on a 20" sterling silver box chain (2.6mm) with DY logo. The original lobster lock was broken and it was replaced with a new lock. Ending Thursday at 9:56AM PDT1d 19hMetal: Sterling SilverStyle: PendantLength: 20 - 21.99"
For your consideration is this large DAVID YURMAN cable renaissance style STERLING SILVER & 18K YELLOW GOLD necklace with pendant. Definitely a statement piece! CABLE CROSS PENDANT WITH 18k SOLID GOLD TIPS, very solid pendant. CROSS PENDANT MEASURES approx 1.8”(44mm)x1.25”(36mm) ORIGINAL DAVID YURMAN STERLING SILVER CHAIN IS 24” LONG & APPROX 1.8MM THICK WITH LOBSTER CLASP, SMALL GOLD ATTACHED TO CHAIN WITH " 925 DY " STAMPS ON IT Fast free shipping. Comes from a pet and smoke free home. DAVID YURMAN. Unisex Cross Pendant. Wearable Length 2" x 1 1/8". Authentic David Yurman Sterling Silver Armory Cross. Hallmarks: (c) D.Y. 925. Cross: 1-1/2in ( with the loop). David Yurman Sterling Silver Petrvs Cross Necklace. Necklace length- is 20"L. Cross is 1.1/2" L x 3/4" W. Pre-owned,in mint condition. Style: PendantLength: 20 - 21.99"
18K yellow gold David Yurman cross pendant necklace with a lobster clasp closure. Designer: David Yurman. Location: Clasp, Back of Pendant. Hallmark: 750, Designer Signature. DAVID YURMAN STERLING SILVER CROSS PENDANT NECKLACE. Sterling silver size large cross pendant by David Yurman. Cross is appr. 1.3/4" long x 1" wide. Pre-owned, in mint condition. David Yurman - SILVER Ski CROSS. David Yurman Sterling Silver Armory Cross Pendant. Local pickup only. David Yurman. silver and 14K gold. easy on and off.